Weee! Love Robert Crowther's work, and always get a wee bit excited when a newbie appears. Not only that--this one features my other great love--alphabet books! Couple with dinosaurs ... I mean, what more could you need?? Deep breath. Let's open the cover. Oooh--deliciousness inside. ABCDEF are dotted across a double-page spread, and who could possibly resist lifting each letter to see what pop-up creature is hiding behind? This is a fabulous book for dino lovers and pop-up lovers alike. 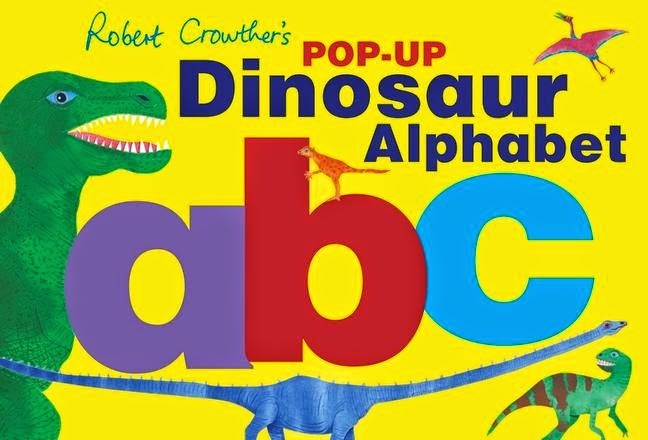 Each colourful pop-up features the dinosaur name, its phonetic pronunciation, and a little factual write-up about each creature. At the back of the book, dinosaurs are shown by size, along with information on dino words like 'carnivore' and 'palaeontologist', and dino eras.